WASHINGTON? NASA Administrator CharlesBolden met with his Chinese counterpart and visited China?s main humanspaceflight launch facility during a weeklong trip the NASA chiefcredited withlaying a foundation for further dialogue and future cooperation betweentheU.S. and Chinese space programs. 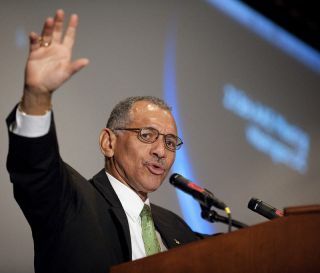 "Althoughmy visit did not includeconsideration of any specific proposals for future cooperation, Ibelieve thatmy delegation?s visit to China increased mutual understanding on theissue of humanspaceflight andspace exploration,which can form the basis for further dialogue and cooperation in amanner thatis consistent with the national interests of both of our countries,"Bolden said in an Oct. 25 statement. Bolden,who was in China Oct. 16-21 as thehead of a small delegation, embarked on his trip amid objectionsfrom several U.S. lawmakers,among them Reps.Frank Wolf of Virginia, John Culberson of Texas and Robert Aderholt ofAlabama? all Republicans serving on the House Appropriations commerce,justice,science subcommittee. "Asyou know, we have serious concernsabout the nature and goals of China?sspace programand strongly opposeany cooperation between NASA and China," the lawmakers wrote BoldenOct.15 as he was leavingfor China. NASAsaid Bolden?s introductory talks withofficials in the Chinese space agency were called for in a jointU.S.-Chinastatement issued by the White House last fall following the officialstatevisit to Beijing by U.S. President Barack Obama. "TheUnited States and China lookforward to expanding discussions on space science cooperation andstarting adialogue on human space flight and space exploration, based on theprinciplesof transparency, reciprocity and mutual benefit," the November 2009jointU.S.-China communique states. "Both sides welcome reciprocal visits oftheNASA Administrator and the appropriate Chinese counterpart in 2010." Inhis statement, Bolden said he met withcounterpart Chen Qiufa, head of the China National SpaceAdministration, toreview ongoing efforts of U.S.-Sino space and Earth science workinggroupsestablished in 2007 to explore common interests. He also said thedelegationconducted "a very comprehensive visit" to Chinese human spaceflightfacilities, including the Jiuquan Satellite Launch Center at thesouthern edgeof the Gobi Desert in China?s Kansu Province. Allthree of the manned Shenzhou spaceflightsChina has conducted since 2003 have launched from Jiuquan. "Iam pleased that NASA was able to meetits objectives for the visit, which included becoming acquainted withrelevantChinese space officials and institutions, better understanding Chinesehumanspaceflight programs and plans, and reaching a common understanding oftheimportance of transparency, reciprocity and mutual benefit as theunderlyingprinciples of any future interaction between our two nations in thearea ofhuman spaceflight." Boldenis the second NASA administrator tovisit China. His predecessor, Mike Griffin, becamethe first in September2006.